Charles Hubert James was born in Bottle Creek, North Caicos on July 4, 1916 to Nathaniel and Isabella James. His parents were hard-working, strong disciplinarians, loving and caring. “Hubert” came from a humble beginning. He knew what it was to go without shoes as he walked the dusty roads of Bottle Creek. He grew up in the area that is called Richmond, a farming area, and developed a touch for plants. He took pride in keeping his kitchen garden where he grew foods for consumption. Hubert attended the Bottle Creek All Age School (now Adelaide Omeler Primary School). He was tutored by Ms. Albertha Seymour, a lady who was very influential in his life and eventually encouraged him to go into teaching. She detected that he had exceptional qualities which should not be left to chance and saw the need for him to pursue this calling. She recommended that he attend the Grand Turk High School (now Helena J. Robinson High School) under Principal Mr. C. E. Crawford. This was a challenge for Hubert. Being a poor boy from North Caicos, going to high school in Grand Turk was a privilege, as very few parents from the Caicos Islands had the financial resources to sustain their children in Grand Turk. Hubert also had to follow in the footsteps of the late Raymond Gardiner who was also from Bottle Creek and who had recently completed his high school education in Grand Turk. Raymond had performed most outstandingly, so a lot was expected of Hubert. This was not his only challenge. Shortly after starting high school, it was discovered that he had problems deciphering information from the chalkboard. He only spent one year in high school as his sight began to deteriorate. He was eventually sent to Nassau, Bahamas where he was fitted with glasses. This was the solution to his problem. Following his return from Nassau, Hubert took up the post of assistant teacher at the Adelaide Omeler Primary School. In July 1944, on the recommendation of Ms. Seymour, he was appointed as head teacher at the Blue Hills School (the only school at the time on Providenciales). This new position brought a new set of challenges, including overcrowding, delinquency, truancy and under-staffing. He believed that to run an effective and efficient organization, these challenges needed immediate attention. He was very outspoken to the extent that he was labelled as “a thorn in the flesh of the authorities.” This did not discourage or deter him. He could be seen walking the beach and going through the communities of Providenciales looking for his students when they did not attend school. This inspired him to develop a good rapport with parents, and the situation started to improve. His concern was the welfare of his students. The year 1945 was a turning point in his career. He was appointed as head teacher at the Kew Primary School, a position he was reluctant to accept for being too abrupt. What further impacted his move was the onslaught of the 1945 hurricane which claimed the lives of 45 men at sea. This hurricane reaped havoc in Providenciales not only killing people, but destroying homes and many of the fishing boats, having a major impact on the island’s economy. The government continued to insist that he be transferred to Kew and it eventually took place in July 1947.The Kew Primary School served the North Caicos communities of Kew, Whitby and Sandy Point. Based on his experience of involving parents and the community, he was quick to foster the same kind of relationships, gaining the respect and trust of members of the community. Hubert was not only a teacher but also a community activist. Following the 1945 hurricane, he spent much time helping the people of Providenciales rebuild their lives, leading the relief effort. Even though he was head teacher with responsibility for the school, he served multiple roles such as Justice of the Peace and Chairman of the District Board. As board chairman, he was the key link between the government and the community. He and his board members were responsible for determining the needs of the community and representing these needs to the government. In 1960, while still in Kew, North Caicos, disaster struck again. Hurricane Donna struck the island levelling homes and dumping inches of rain resulting in severe flooding. Mr. James’s recovery skills were once again called into action. He was so concerned about the welfare of the people that he overworked himself, falling ill and having to take a three-month respite. Despite his health challenges, when Governor Kenneth Blackbourne of Jamaica (with responsibility for the Turks & Caicos Islands) came to visit, it did not prevent Hubert from writing an enlightening song called “Hurricane Donna” and training the children to sing it during the visit. In July 1969, after serving some 25 years at the Kew Primary School and a total of 37 years in education, Hubert decided to retire. He continued teaching children privately, writing wills for people, settling disputes between family members, assisting persons with the administration of their properties and sitting on various boards. In 1972, he was one of the leading voices, along with Ms. Omeler and Ms. Jessie Campbell (two former head teachers in North Caicos, now deceased), agitating for a high school on North Caicos. They knew what children from North Caicos who attended the high school on Grand Turk experienced. 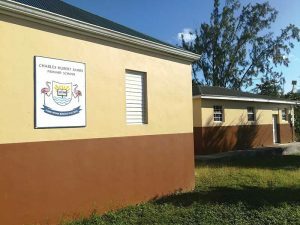 They felt that it was time for North Caicos to have their own high school where children could be close to their parents. The trio went about gathering signatures from the community. Their efforts were not in vain. One year later, in September 1973, the North Caicos Junior High School opened its doors to 99 students and 3 teachers, with Hubert’s daughter Hope James-Hamilton as the first principal. The school was later named after Raymond Gardiner and became a full-fledged high school a few years later. Mr. James was a loving, caring and kind man. He was devoted and passionate about education. As a headmaster, he had the distinct honour of meeting several administrators and commissioners of the Islands. He also served as Returning Officer in three general elections and was appointed to various government boards. He was appointed as a Justice of the Peace in 1956 and reappointed in 1970. In July 1966, he was awarded The Queen’s Badge of Honour which was personally bestowed on him by Her Majesty during Her visit to the Islands. In 1974, he was awarded The Member of the British Empire (MBE). In 1984, the Kew Primary School was re-named in his honour as the Charles Hubert James Primary School. 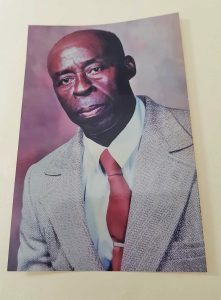 Just before his death on August 18, 1997, in June he received an accolade from the Providenciales Native Men’s Fellowship for his outstanding work. Charles Hubert James was a patriot who dedicated his life to TCI’s education system. He was not afraid to speak his mind as he represented the interest of those who were voiceless. He was a true example of a man who cared about the welfare of his students, who he served with dignity and pride. His life is a tribute to one of the lines of the TCI’s National Song: “Our Allegiance Turks & Caicos we pledge and we affirm.” He certainly pledged his allegiance to making the Turks & Caicos Islands a better place.